Samsung is apparently getting closer and closer to releasing its first software versions based on Android 4.4.3. The first devices to get an Android 4.4.3 build from the Korean company are going to be the Galaxy S5 and the Galaxy Note 3, it seems. That would make perfect sense, given how these are right now Samsung's flagships in their respective market segments. In the case of the Galaxy Note 3, development has reached the final testing stage. If all goes well, the new bits should be ready to roll out to users sometime in July. 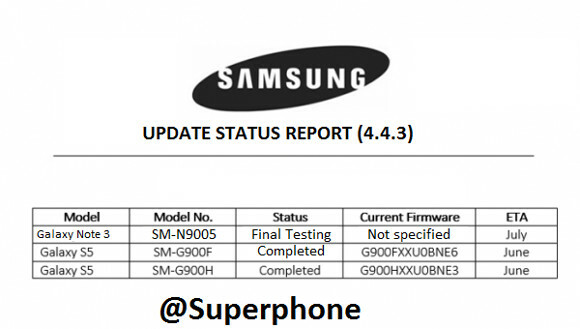 Previous such leaked documents surfaced last month, when the Galaxy S5's update was still being worked on. Now that it's finalized, the guessing game begins - which will be the first territory (or carrier) to get Android 4.4.3? One thing to note is that the document pictured above has some odd font differences in it, which may indicate a bad Photoshop job. So do take this with a pinch of salt. Further complicating things is the fact that Google has just released Android 4.4.4 to its Nexus devices, a version that seems to contain a pretty important security fix. That leads us to wonder: will Samsung first release 4.4.3 for its devices only to then start working on what is now the latest version of the OS? Or will it choose to skip 4.4.3 altogether and simply come out with a 4.4.4 build, even if that means delaying the release for a short while? Since the newest iteration of Android isn't bringing new things to the table, just fixing bugs, the latter hypothesis isn't completely implausible.